Under the High Chair: What's in a name? I always wondered why babies spend so much time sucking their thumbs. 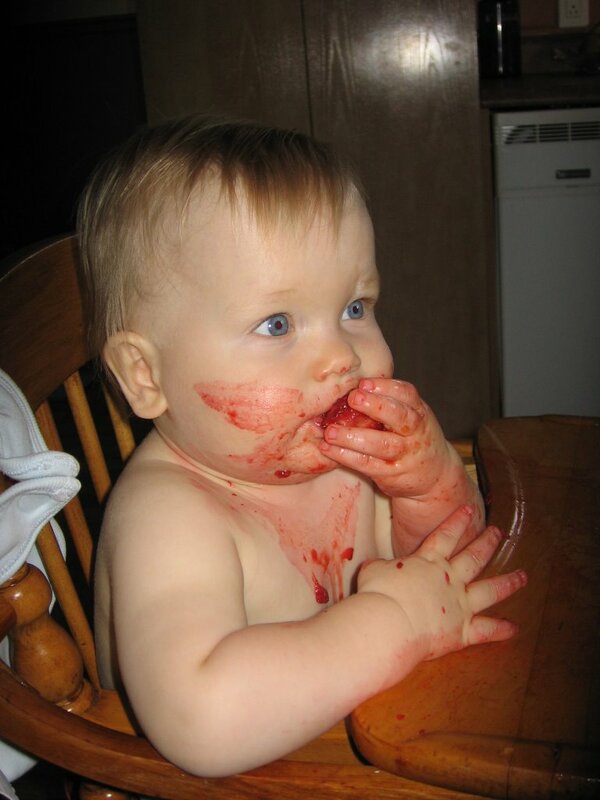 Then I tasted baby food.” Robert Orben (1927--) American humorist. I suppose I should explain my blog name a little further and introduce you to the Little One under who's high chair many of my lovingly prepared meals end up. This is Noah, my first child, and as you can see, no, he's not starving to death, so I am successful in filling his tummy sometimes...yet, he's been my harshest critic. I always knew I would make my own baby food, that it would be easy, that I would save money and at the same time be giving my baby the best possible start on life. I just wasn't prepared for him to hate it. I made braised beef with fennel and carrots, whole-wheat pasta with ricotta and broth, roasted chicken with sweet potato...mouth-watering, right? Well, if I could get him to eat a few mouthfuls, the slightest pea-sized lump would make him gag and occasionally he would regurgitate everything up from the bowels of his gut. Not a pretty sight. So, I am taking it slow, working with his favorites, and occasionally slipping in something new. 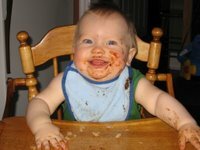 Last night he ate mashed up lasagna, so I guess there’s hope. Still there is an awful lot of food that ends up under the high chair, but there are some perks- I didn’t name my blog "What’s in Noah’s Diaper"? Right? "What's in Noah's diaper?" could be a parallel blog for those of us who ask that very question. Enjoying the blog so far. Keep it up. Hoping Amber will try some of these recipes on me once we're home again. Looks good, Aimee! The recipes look great! I look forward to reading more. I also think that your, well, "alternative" title would have drawn an "alternative" crowd. But a crowd nonetheless. Thailand, Singapore and United States are the most favorite Tourist Destination for Indians: In this report, we have done comprehensive analysis of top 11 destinations for India outbound tourist. We have also studied the number of separate factors that affects India Outbound Tourism to each of 11 destinations. In addition, we have done detailed analysis of growth drivers.